For those of us who eat meat, red meat can be a staple part of our everyday lives.But in eating this meat – and eating it on an all too frequent basis – we are leaving ourselves open to problems with our stomachs, digestive tracts and our bowels. Red meat – it is true – provides us with the relevant amount of Iron that our bodies need but on the down side it can also be one of the causes of colon cancer in adults in their forties and fifties. Individuals who suffer from the condition known as Irritable Bowel Syndrome (IBS) are often at risk of lapses in health and the condition of their bowels due to over consumption of red meats. This is because generally red meats take longer than any other kind of meat to digest and make their way through the human body. As unpleasant as it is to talk about it, it is a fact that whilst making its journey through the human body this red meat can quite simply ‘go off’ and in doing so will begin to release levels of toxins into the system that can bring about an acute episode for an Irritable Bowel Syndrome (IBS) sufferer. Many sufferers of the condition, which also affects the stomach, abdomen and lower abdomen, have found that cutting down on their intake of red meat – if not cutting it out all together – has reduced these periods of ill health. It is also worth mentioning that although the meat you are eating has been slaughtered humanely and has been kept under the correct conditions it still contains trace elements of the antibodies and drugs that have been given to the animal while it was alive to help it combat illness and to reduce its risk of catching any airborne diseases. Studies have shown that in some instances sufferers of Irritable Bowel Syndrome (IBS) have been prone to bouts of ill health because these trace elements – even after the meat has been thoroughly cooked – have managed to get into their systems. If you feel you simply must eat red meat then it is wise to cut down on the portions. A small amount of red meat cooked well alongside a mixture of fresh vegetables can go along way to help invigorate your digestive tract. Also if you are eating red meat cut down on the amount of potatoes you have with it; this is advisable because of the amount of starch contained in the potatoes which – when combined with the red meat – make for a hard to digest meal. When cooking red meat you should do so in small pieces so that it is easier digestible. It is also worth perhaps grilling or stewing the meat to reduce the amount of fat contained inside. 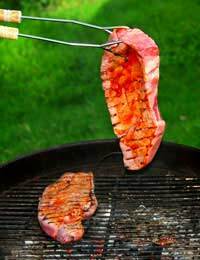 You might also consider – although many people say this is where the meat’s flavour is – removing any rind on chops or steaks so that the meat is tender and not over fatty. As a substitute to meat on occasions why not try fish or chicken with fresh vegetables or salad. Of course if you do feel you need to cut red meat from your diet altogether it is best to consult your GP; he or she will give you useful advice on how to supplement the change in your diet so that you are still receiving the necessary amount of iron and protein in your diet. It is wise not to suddenly stop but to gradually reduce the amount of meat that you eat and slowly build up the substitutes for it. Great article, very informative. I never knew that red meat could be quite so problematic to digest. Nor did I know that the drugs the animal has been given whilst alive can effect certain people who have IBS. I think I'll be cutting down on my red meat intake in the future!